"Gardens at Dusk" Tank Tutorial! 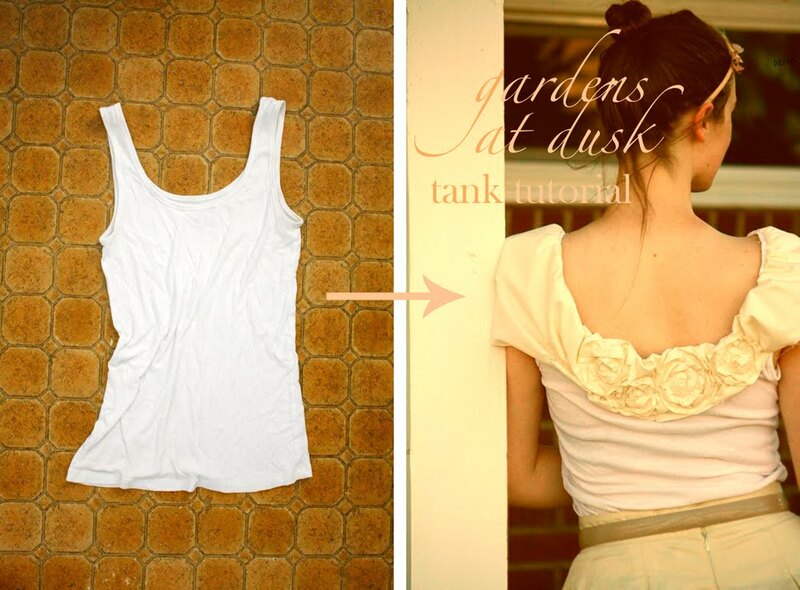 I love this tank refashion, because it's almost like having sleeves! I always feel a little exposed in sleeveless shirts. *This version was made using muslin, but it turned out a bit poofy in my opinion. I would love to see it with something a little more flow-ey. Chiffon? A gauzy cotton? A lightweight knit even! The ruffles would drape over the shoulder a little more easily and be very elegant! 3. Lay the smaller strip on top of the wider strip and zigzag along the flush edges, through both layers of fabric. (This is optional-it just finishes off the underside) Then sew a gathering stitch slightly inwards from the zigzag. 4. 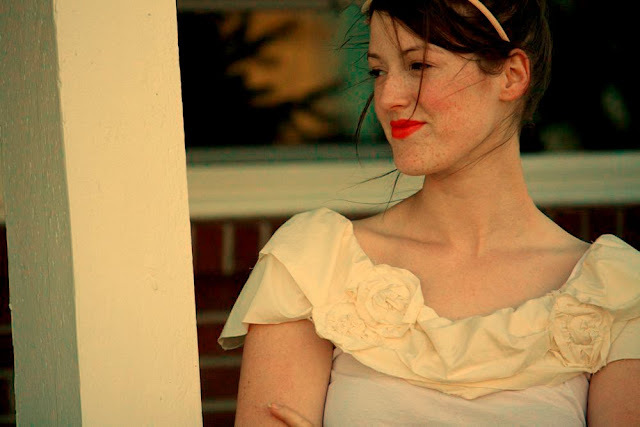 Ruffle, and pin to the neckline. (Please note: the strips are upside-down in the photo, the smaller ruffle should be facing toward the table-oops!) Starting in the middle of the back, sew on with a zigzag stitch. When you get all the way around, sew the two ends together and snip off the excess. 5. Cut seven 2"x22 strips and ruffle them, then roll into flower shapes. 6. Figure out your flower placement (you may want to try the shirt on for this), and pin them on, gathering the ruffles up slightly underneath them. 7. 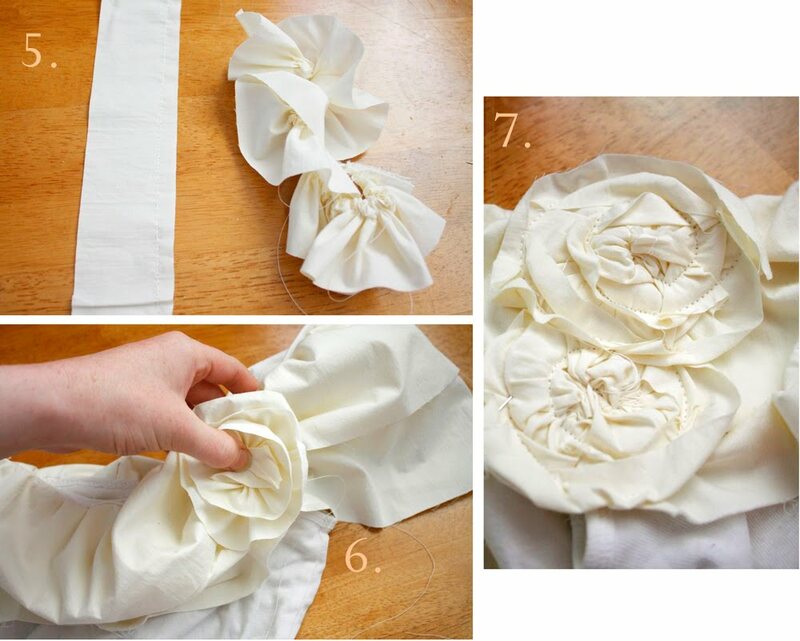 Sew them (to the ruffles only, not the shirt) in a spiral pattern, which will flatten the roses out as you go. If you want to, you can sew the flower to the shirt in a couple of places to anchor the top down. Just not too much, or your shirt won't stretch out properly! Enjoy your pretty (and more modest!) tank! Disney, I love these pictures. Especially the one of you in that chair in the field. Gorgeous. The light, the setting, the sphere. Beautiful. I love it! It's very ladylike. 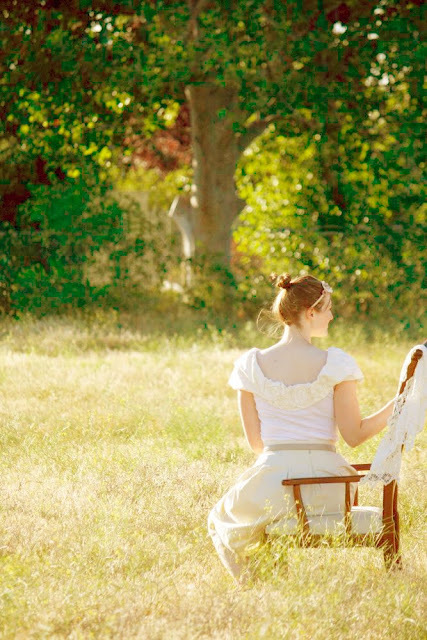 Those pictures remind me of Sense and Sensibility! It looks fabulous! Absolutely beautiful!!! You are very creative and I do not know why you doubt your ability. Delightful! Beautiful pictures too. I'd love to try this one! Beeeautiful! I would love to try this.. I like to wear sleeves, too, so this is great. Thanks a bunch! Bravo! Thank's Disney for this awesome Idea! This is perfect! I've been looking for a little top to wear with my skirts and haven't found anything until now/ Thank you, thank you! I still owe you an email and I promise I will write when I can come up for air. Beautiful photos and beautiful top! Oh this is an awesome idea! I have so many tank tops but I can't wear them to work because of our dress code. With this, now I can! Plus, this will give me some use for all the hoarded lace I have! Yee! The pictures are beautiful! I love them! I love the lighting! I like what you did with the top! you're really good with ruffles! :D love reading your blog. Pretty alteration! I love that idea. I don't wear tank tops either, but the way you change it would probably still keep me cool and modest. Thanks for sharing! And love the photos of you, too. Lovely! So feminine! And the pictures are great! So beautiful! (The shirt, the pictures, and the girl!) 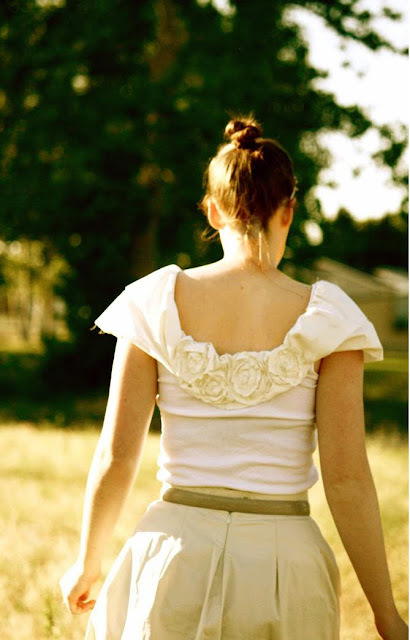 I love to see refashion ideas that make clothing more modest! i love this! my sewing machine is packed in a storage unit because we are moving, but when we finally get settled, i can't wait to try this! This is so romantic and pretty. Lovely shots. This is really cute, and great pictures to show it off! I'd like to share a link on sewwhattoday.blogspot.com on July 7! Amazing Dinsey never seems to amaze me how awesome you really are!!! happy belated birthday! I've never commented on your blog before, but just so you know, you're my favorite. 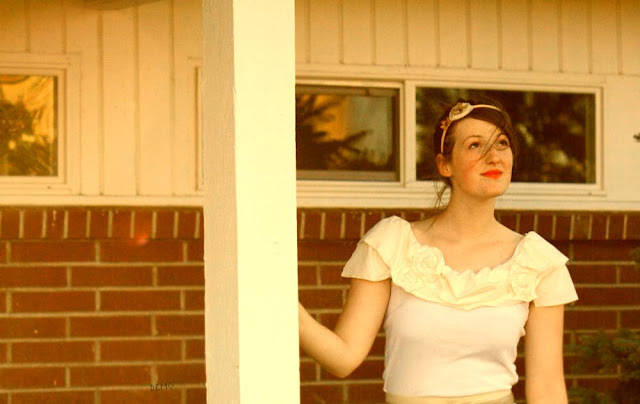 I have lots of crafty blogs I love and read occasionally, but yours is the only one I read regularly. I just adore your style...the pearls, the femininity, yet your ability to go casual too. I swear to you now, I LIVE in your jersey skirt from last November. It's a summer must-have in my book. Ooh, the flowers in the back - what a gorgeous look! I really like the muslin, it's so vintage looking. This is stunning! I can't wait to try. Here in Alabama it is VERY hot! All I want to wear are tank tops. I plan on using alot of your ideas to make them cute. Plain is boring. I love what you do with them! Perfect idea for this tank top!! such gorgeous pictures too!! Love the whole post. Disney! You have done it again!!! Love this! I discovered your blog this weekend and have a major crush. I love this tank. I am going to pull my sewing machine out of storage and give it a try. I love this one! Now if I only had a tank top to do this to, maybe I will just have to try the local thrift store or something. this is soooo amazing. i am always excited when you say you have a tutorial coming up. this one totally blows my mind. thanks so much for doing this Disney! That is such an amazing idea! Dee: Help yourself! I would be flattered! Margaret: My husband takes them for me! ;o) He's so nice! I was in Yakima over the weekend and thought of you. Maybe we'll make our way a little farther East later this fall. I would love to see you! Goodness gracious Disney! You never cease to amaze me! 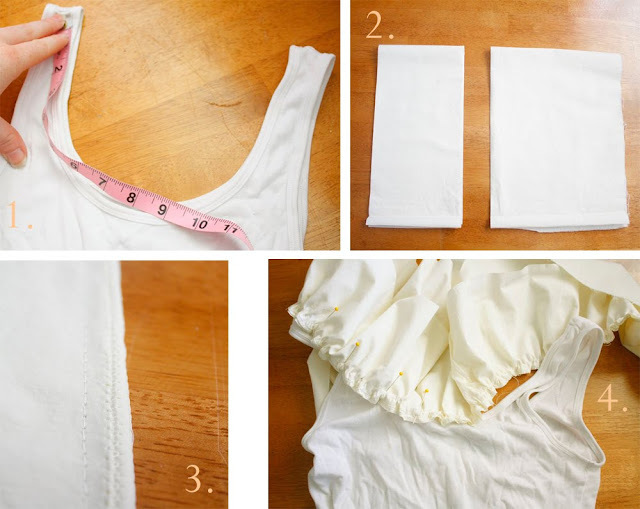 I will totally be trying this...I've got some lightweight knit and a white tank begging to be refashioned! I'll link up when it is finished! How beautiful!! I love your blog, and check it almost every day!! Thank you so much for all of the wonderful ideas and amazing instructions! My girls and I made necklaces for the 4th of July--everyone loved them! you are amazing! This is just lovely...and the pictures are dreamy. Wow Disney, that's so pretty! I'm constantly amazed by what comes out of your head. Thank you for sharing it. THIS IS STUNNING!!!! Love to make one myself!!!! will see if I can manage it this week just before our holiday!!!! I love it! I feel the same way about wearing tank tops. I am so glad that I am not alone. Disney! I LOVE it! What a fantastic, original idea. The back of it is my favorite. I never would have thought to put the flowers on the back, too. Gorgeous! This is so beautiful and classic! I love your pictures! I'm so glad you posted about making the flowers. I hadn't looked for a tutorial yet, but now I have one! Thanks! Ann: Yep, you've got the gist of it! I started on the outside when I sewed them, but I think it would come out the same either way. And thanks!! i just wanted to let you know I left your website pulled up on the phone at the sprint store. I was checking it while we were in there looking for new phones and thought maybe it would send you a new follower! have a good day! I just may try it myself!!!!! I just love this! I always would rather have a little bit of sleeve, too. Oh, I just adore you and your creativity so much. I'm definitely going to try this. Disney, that has to be one of the most beautiful, original refashioned shirts I have ever seen. That will make a beautiful Sunday church shirt for me. Thank you!!! Wow, what a transformation! That tshirt is now a romantic piece. I love it. The flowers seem to be a lot easier to make than I thought. I like the idea of flattening them by sewing them in a spiral fashion, awesome! I have to say that I had been on a blog burnout lately. I felt like every blog I loved was starting to become a little stale and repetitive. And then I discovered your blog and it is delightful. Thank you. Just was reading a little of your previous post, and am glad you are a Christian! I love the Lord too. That looks great! One of my friends had a store bought shirt that was similar to this, ruffle in place of sleeves, that I've been wanting to make. I love this idea! Maybe now I can pull those tank tops back out! I love it, it says to me...jane austen. At the risk of gushing, Disney, you are absolutely amazing, inspiring, gorgeous, brilliant, and a Gift! Thank you for the time you spend sharing your gifts and your creativity. Oh, if I could only be half as talented as you! You are my "wanna be"!! PLEASE know that you have a gift that is beautiful and very, very motivating and inspiring. 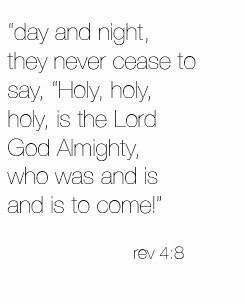 Keep shining the light God gave you! I need it in my dark corner of the world! I love it. Im a beginer sewer. I'll be making one after Im done taking my sewing class. Hopefully then I'll be able to sew a spiral for the flowers. Right now I'm horrible at making spirals :( Any tips? just stumbled across your blog and i think its GORGEOUS! oh, perfect for my tank tops with the skinny skinny straps...what a cute sweet "i can do it" idea! What a stunning picture of you in the sunlight. Wow. I love the tank too. Can't wait to make one. Thanks. Sweet! Thanks for the great tut! Thanks for the tutorial, Disney! I'm new to sewing so I didn't have a stash, but I made the flowers from your tutorial directly onto a tank...I love it! Like everyone's been saying, you have an amazingly creative gift...but I have to say that being organized enough to share it with others is also an amazing gift...thanks! How beautiful... Thanks for the tutorial. I love your blog. I hope you can drop by and check out my version. Thank you once again. Great easy tutorial. thank you very mutch for this great tuto ! Oh my goodness!! I "Stumbled Upon" your blog. I Love all the ideas. Thank you!! I espcially love this tank. Can't wait to try it. Going into my Favorites Projects file. This is sweet, I love it! I have always liked wearing tank tops, but now that I'm in my late 50's, it just doesn't look the same as it did when I was 25, lol! This idea softens it up, is very feminine and is so much more appropriate for someone my age. Thank you so much! Disney - this is gorgeous! LOve it! Hand to believe it started as simple tank! Hosting a (quick) Tank Refashion party today (inspired from the Old Navy tank sale this weekend) and would LOVE you to link up! Oh I just love this! It is so soft and pretty looking. I think that you should add these flowers to the skirt you added to the tank top. It would be beautiful and tie the whole outfit together. Love it all. This is gorgeous! And I'm with you, I love something a little more modest, especially since I now have Grandma Wings (grandmas are angels, and angels have wings - that's my story for the floppy arms, and I'm sticking with it!). Thanks for a great way to wear tank tops. Love this top! So romantic! And the photo of you in the field, gorgeous! I have to agree with RevDi, love the 'Grandma Wings' term for old-age floppy arms! Thanks for sharing this idea with us. So beautiful and romantic, thanks so much for sharing the tutorial. And the photos are gorgeous! I have a load of cheap tanks I picked up for next to nothing at my favourite charity shop (thrift store). I must try this. Think I'll use a soft knit, maybe recycled extra large T shirt, for the ruffles and roses. RevDi, love your explanation of Grandma Wings! Here in England, they are called bingo wings. Now, I'm not a grandma, and I don't play bingo. I'm pretty sure I'm no angel, either. So why have I grown wings? Until I saw this tutorial, I had not idea that this is exactly what I have been looking for! I really don't like to wear sleeveless tops in public and this will be the perfect finish for the black top that I can use. The addition will be in Yellow. I am a member of Beta Sigma Phi and our colors are yellow and black. This is SOOOOOOO perfect for our special rituals and I am going to get on this quickly. Thanks so much.